Convert OST to PST Tool - OST to PST converter tool is a very proficient tool which helps the users to recover damaged and corrupted OST file very quick and meticulously. This tool provides the feature to convert OST file into office 365, live exchange and Outlook PST file. 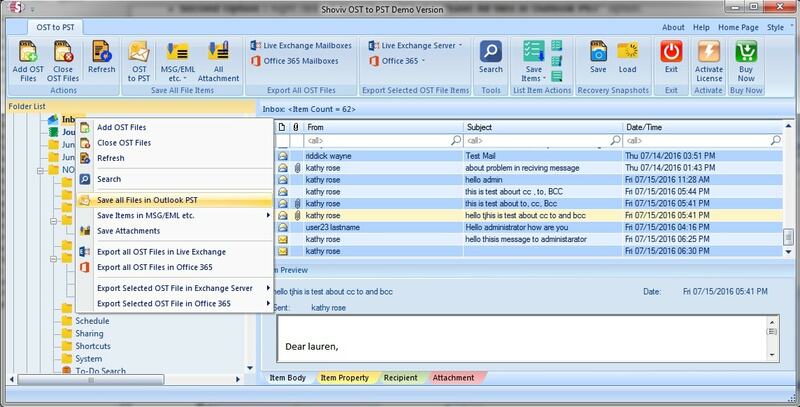 Shoviv OST to PST converter tool provides a proper solution to convert OST files into PST file. This tool equips multiple features like the facility to recover corrupted and damaged OST into multiple formats such as PST, Office 365, Live Exchange as well. It allows to save OST files into various format such as .eml, .msg, .html, etc. This tool also provides preview option which helps the users to preview Item data and properties directly into software interface before performing conversion task. Shoviv OST to PST converter has user friendly graphical interface which makes the process faster and meticulously. This tool supports all the version of MS Outlook including 2016, 2013 and older versions. It has free a trail version which allows users to convert first 25 items per folder. If you have any query or face any issue to use our software the you can contact our support team 24*7.